Are you in the business of marketing? 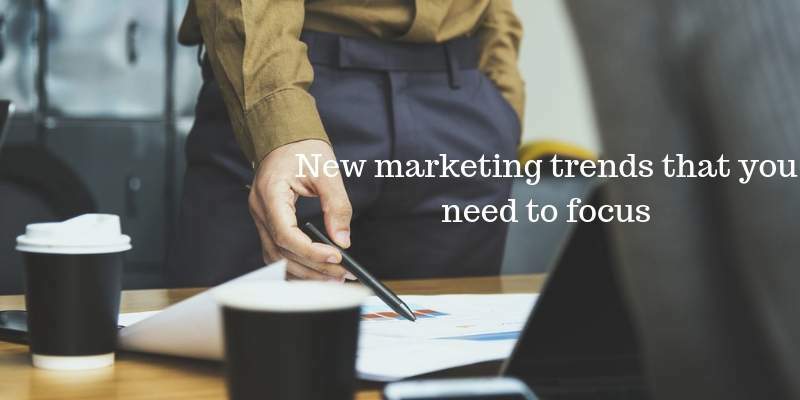 What are the new marketing trends you should be paying attention to? Here are 10 profitable ideas to know about. The world of marketing is fast-paced and ever-changing. Thanks to new technologies allowing businesses to research, reach, and engage consumers, the best marketing tactic to use one day can easily change the next. You have to stay on your toes to figure out the best opportunities for your business. One day your campaign may be focused on content marketing and reader engagement, while the next it could be all about experiential marketing and creating a memorable interaction. As you’re executing new ideas, you have to keep an eye on new marketing trends as they come and go. Pay attention to what users respond to best and what “hot” trends just aren’t working for other companies. If you’re not sure which trends will work for you, use the list below to help you choose something new. Here are 10 of the most popular and effective emerging trends in marketing right now. It’s no secret that SEO is a big deal. But, your search strategies have to be carefully thought out in order to grow your company’s presence in a market. You can’t just put together a few pieces of content and create a link building campaign anymore. You have to make sure all your information is easily available via voice search. Voice is the next big thing right now; it’s on track to surpass regular mobile and desktop searches. This will create a similar shift to the one that mobile first made. Once a user finds the content they’re looking for, they need to be completely pulled in by it. One way more and more companies are hooking their audience is by using augmented reality. This has become particularly popular for eCommerce sites who want to show how a product can be used. But, it can do wonders for other industries like interior design specialists, HVAC and other blue-collar contractors, and more. Whether you sell home furniture or you offer travel booking services, you need to start using chatbots if you haven’t done so already. Chatbots have completely changed the consumer experience. Implementing this tool means you’re now able to offer ’round the clock support for your customers. You can answer all their questions on everything from a sale delivery to how a product works. More importantly, you can do this in a direct, straightforward manner in a shorter amount of time. It’s pretty common to see in-store financing for big purchases like furniture or raw materials. Somehow, this trend has now entered the digital marketing space. Plenty of eCommerce companies now offer financing options for users to buy now and pay later. Companies who used to only do this in-store are now making it available on their mobile platforms, too. This is making purchases more accessible to users and increasing a company’s sales numbers as a whole. Not only is eCommerce financing on the rise, but thanks to shoppable social media posts, digital marketing and sales now truly go hand in hand. Shoppable social media posts are those that have a direct link to products in the post. These aren’t just included at the end of a caption anymore. Now, they’re a unique component contributing to the overall look and feel of an image. This was first introduced on Instagram, but it’s only a matter of time until users start to see it on Facebook and possibly other platforms, too. Another marketing trend which has been heavily focused on Instagram is story polling. Companies are swapping out customer research and traditional surveying for simple polls that can deliver fast results. Polls are helping companies do everything from deciding on the color of a new product to the date of an upcoming event. They’re breaking the barriers between real-life consumers and the companies they buy goods/services from. The result is a much bigger amount of understanding of what users want, and more responsiveness from companies as they work to deliver what’s been asked of them. Hopefully, you’ve realized how big influencer marketing is by now. This is a hot marketing trend that is not going away anytime soon. In fact, with tools like IGTV, it’s expanding! Instagram has created a separate platform for influencers and everyday people to interact. It’s called IGTV, and it already has more than 1 billion users. This number is only going to grow and the opportunities available when you make it part of your marketing strategy will start to multiply, too. As helpful as influencers are to reach and engage your audience, at the end of the day, everything comes down to your brand. You need to be well aware of how users perceive you. More so, you should always strive to focus on the good and create positive interactions, while also recognizing and solving any negative experiences. These are the basics of reputation management. Reputation management is a marketing tool which helps you understand how consumers perceive you. It helps you track all kinds of online discussions about your brand. This is the first step in fixing a negative brand image users may have, and in putting your brand in an even more positive light than it already is. A big part of reputation management is pulling data from user-generated content to see how users feel about your brand as a whole. Positive user-generated content can do a lot of good for your brand on its own, though, which is why so many companies are encouraging it. User-generated content can boost your search performance, increase trust within your market, and set you apart as an authority. It strengthens your reputation and makes it easier to find you as well. The final marketing trend you need to start using is the practice of personalizing content. It’s not enough to send out mass messages anymore. You have to reach your audience in a direct, personal manner if you really want to stand out. It’s a skill companies like MRP have perfected and one you can’t afford to overlook. It’s one thing to understand what the best marketing trends are right now and another to capitalize on them. You need to have a deep understanding of a new tactic before you implement it into your campaigns. This goes for old and new marketing trends. Certain classics, like direct mailing and SMS campaigns, aren’t going anywhere. But as more new, innovative ways of reaching consumers come out, you need to hurry to learn about them and effectively use them. Set clear KPIs and make sure you’re getting out of a marketing initiative more than what you put into it. Watch the relationship between new marketing campaigns and sales, too. If you’re interested in other ways to boost sales, click here.